Featured Artist: Stephen Hill from the album Christmas: A Time for Joy . The guitarist uses a capo on the 2nd fret and plays in the key of D Major. The reason he plays in D Major is that it is one of the best keys for fingerpicking, especially when you can play around the D chord with Dsus4 and Dsus2 with ease and speed. Note how the guitarist uses trills on the D chord (Dsus2 - D - Dsus2) throughout the song. I haven't included them all as the chart starts to get a little messy. You don't have to play them, but make sure you listen and learn how well they can be used in a song... works very well here. Trill: alternating rapidly between 2 adjacent notes - usually a tone or semitone apart. In this case the trill occurs on the 1st string of the Dsus2 (E) and D (F#)chords making the trill a tone apart. With the trill he plays a Dsus2 / hammers-on to the D chord / releases the hammer-on back to the Dsus2... this is all done in half a beat or eighth-note, so if you count the bar as |1& 2& 3& 4&| and he plays it at the start of the bar, it would be on the 1 of 1& etc. This sounds very fast, but listen and try it for yourself. Make sure you play it very slowly till it starts to flow, then pick up the pace until you get to the right tempo. The fermata or pause symbol means you hold the note for a duration determined by the performer. In the Intro you hold the chord for the bar. the 'h' means a hammer-on. In the Intro the h-D means you hammer-on the D chord from the Dsus2 without strumming the D chord. So, at the start of the 4th bar you strum the Dsus2 and hammer onto the D... if you listen carefully, you will hear this. The D/F# chord is simply a D chord leading with an F# bass note. You can play the F# bass note with your thumb if possible... the best way. Another way is to play the D chord with fingers 2, 3, and 4 leaving your first finger to play the F# bass note, although this will need a quick finger re-arrangement from D to D/F# and some of you may find this a little awkward. Alternatively, you an simply play a D chord adding the F# bass note on the 4th string, 4th fret... you need to avoid the 5th string (A), as you are leading with F#... xx4232. You don't have to play the hammer-ons or trills, and you don't have to play Dsus2 or D/F#. You can play a simple D chord and it still sounds fine. This way, beginners can play along with ease. The time signature is 4/4 time which means 4 quarter-note/crotchet beats per bar. The tempo is set at 80 bpm in quarter-note time (♩)... beat sounds on every quarter-note if you are using a metronome or click track. Stephen Hill was an American singer / songwriter, born in Missouri and raised in South Carolina. He came from a musical family and as a young adult, Stephen sang at the local church and radio station. He appeared regularly on the popular 'Homecoming' series of videos, CD's and concerts. Stephen moved to Nashville in the 90's and worked as a studio musician. Here he played guitar and bass as well as singing and working on various projects from records to television. Stephen used his music talents to spread the Gospel of Jesus Christ in song. He sang his message of love and hope and trust in God to people in The USA, Canada and The United Kingdom. Stephen has a large collection of works which are all available on iTunes including Five Little Fingers from the gospel album, Christmas: A Time for Joy . 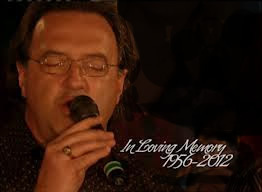 Stephen Hill passed away suddenly on Sunday, August 5th 2012 after a massive heart attack at the age of 55. I received an email requesting this song. As soon as I heard it, I knew I had to chart the song and share it with everyone, especially leading up to Christmas. Stephen has an exceptional warmth and heart-felt quality to his voice and delivers the song beautifully. I had never heard of this song or of Stephen Hill for that matter, but I am forever grateful for the email that alerted me to this wonderful talent. As I began my research, I quickly discovered that Stephen had died unexpectedly in 2012. I was deeply saddened by the news as I had just listened to the song and wanted to know more about Stephen and his great work. May he rest in peace and many thanks for the opportunity to share this beautiful song with all of you. "Five Little Fingers" chords and lyrics are provided for educational purposes and personal use only.